Today I’m taking hair care back to the old-school with a bit of Timotei shampoo and conditioner. Yes, Timotei – it’s still around and I’m pretty sure I’m not the only one who remembers using this as a kid? I’ve tried to find some old 90’s pictures of the brand to spark your memory, but google is not being my friend as I write this. But I distinctly remember Timotei being the go-to in my home as a child, mostly choosing which shampoo/conditioner based on the scent rather than hair type. I’m sure I remember a really sweet cherry version, but I may be making that up?! I’m also sure I remembered them bringing out a blonde version back in the day, that had me very excited – see, a beauty junkie from a very young age! 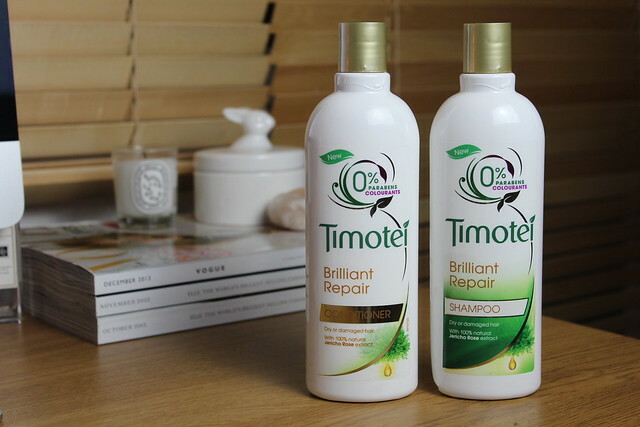 But this post isn’t about a trip down my shampoo memory lane, it’s about today’s Timotei Brilliant Repair Shampoo and Conditioner* and if they’re any good. I’ve been using these two for probably around a month (not 100% consistently, I do tend to rotate a couple of shampoos at any one time – but around two/three times a week). My first impression was that they smell lovely (a definite trait of Timotei I remembered) and that the conditioner was quite runny. Almost as much of a liquid consistency as the shampoo – where I’m more used to conditioner feeling fairly thick to use. But despite that, the combo manages to leave hair feeling sparkly clean and healthy. Which I like, as with fine hair – when I tend to use repairing/hydrating shampoos I can often be left with hair that’s probably healthier/more hydrated – but also a bit weighed down/limp – always having to make the choice between healthy hair, or hair with volume… a definite case of the #bloggerproblems ! Basically I really like these two, partly for the nostalgia- partly for the actual results! Plus for £1.99 each they’re a bargain. Looks like great haair products! I allready love the brand since my mother (in Finland)always washed my hair with Timotei when i was a little girl! I haven’t used Timotei in years! Thanks for the idea to check them out next time I’m out for shopping! i stated using timotei coconut oil shampoo abt a month ago… great shampoo. i hv thicker n healthier hair!